31/03–02/04 The second Alpine Meeting on Natural Products takes place in Obergurgl! 22/03 Lara has successfully defended her PhD Thesis. Congratulations Dr. Weisheit! 11/03 Dr. Schiesser from Astra Zeneca, Gothenburg, Sweden is visiting the Department. 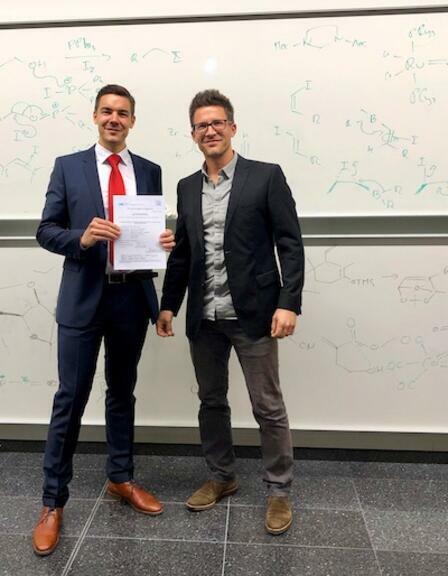 09/03 Congrats to Matthias for the acceptance of his manuscript entitled "Ring-Expansion Approaches for the Total Synthesis of Salimabromide". This work will appear in the Tetrahedron Special Issue Honoring Ryan Shenvi! 04/03 Robin has joined the lab for his Master Thesis. Welcome to the group! 04/02 Christoph joins the lab as a PhD student. Welcome back! 28/01 Dr. Barber from Bayer Crop Science gave an inspiring talk about "The chemistry behind the aminoisothiazoles: a new class of herbicides"
07/01 Big C joins the lab as a PhD student. Welcome back! 14/12 The X-Mas party takes place at Soulkitchen. Happy Holidays! 01/12 Congrats to Sofia and Franz for receiving a TWF Jung-Investigator Fellowship! Well deserved. 21/11 Raphi has successfully defended his PhD Thesis. Congratulations Dr. Wildermuth! 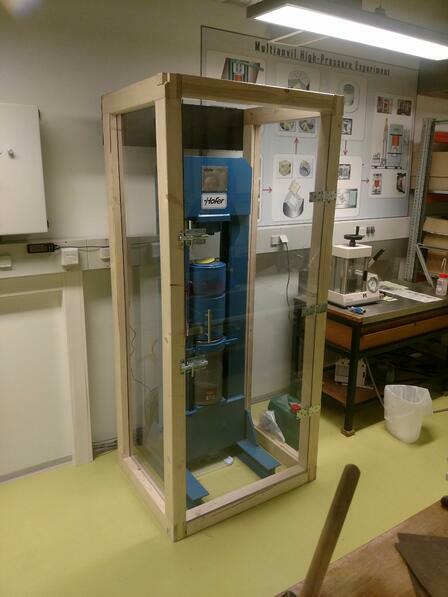 25/10 Our high pressure apparatus now has a protective shield. Safety first! 11/10 The Groupouting to Seefelderspitze takes place. Enjoy the Golden Oktober! 01/10 Great talk my Prof. Mingji Dai (Purdue University, USA). Perfect start to the winter term! 03/09 Lukáš Maier has joined the lab as an "Experientia" Postdoctoral Fellow. Welcome to the group Lukáš! 03/09 Tobias has joined the lab for an internship. Welcome to the group! 23/08 Congrats to Matthias for his appearance in the most recent "Synfact of the Month"! 09/08 Prof. Tim Newhouse from Yale University is visiting the Department. Thanks Tim for giving a highly inspiring lecture! 06/08 Immanuel Plangger is joining the team for an internship. Welcome Immanuel! 23/07 Jonah is joining the group for an internship. Welcome to the group! 01/07 Congrats to Matthias for the acceptance of his most recent work "Total Synthesis of Salimabromide, a Tetracyclic Polyketide from a Marine Myxobacterium" in JACS! 01/07 Lukas is rejoining the group for his PhD thesis. Welcome back Lukas! 19/06 Congrats to Dr. Lukáš Maier for being awarded a prestigious Experientia Foundation Fellowship. Lukas will join the lab in September. Looking forward to your stay with us! 04/06 Dr. Gabriele Prina Cerai from the Morandi Lab is joining the group as a postdoctoral fellow. Welcome to the group Gabri! 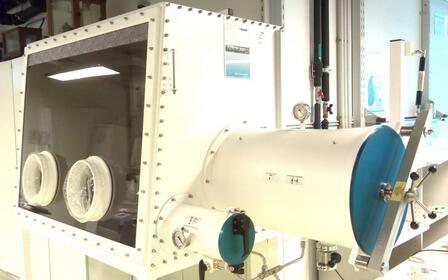 15/05 Our new glovebox was installed. 25/04 Tommy speaks at the Wissensdurst Festival 2018 @NAX. Thanks to the organizer and the great audience! 23/04 Tommy was elected to the Young Academy of the Austrian Academy of Sciences (ÖAW). 18/04 Christian has joined the lab for his Master Thesis. Welcome to the group! 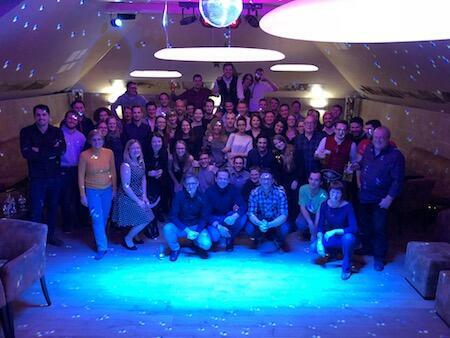 13/04 The "Lange Nacht der Forschung" event takes place across Austria! 10/04 Christoph has joined the lab for his Master Thesis. Welcome to the group! 14/03 First Alpine Meeting on Natural products takes place in Obergurgl! 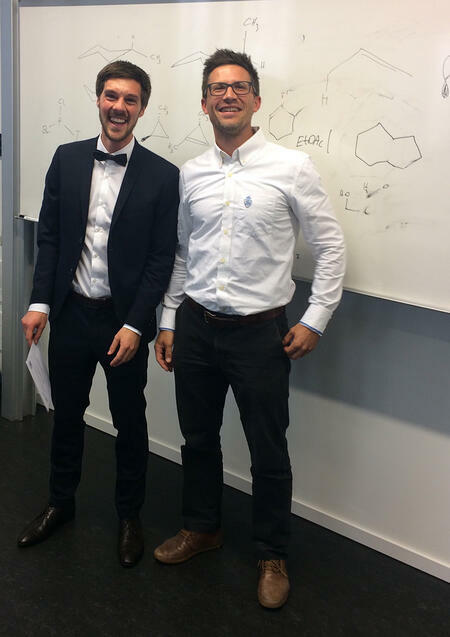 19/02 Congrats to Franz and Raphi for the acceptance of their manuscript entitled " A Negishi cross-coupling reaction enables the total synthesis of (+)-stachyflin" in Tetrahedron. 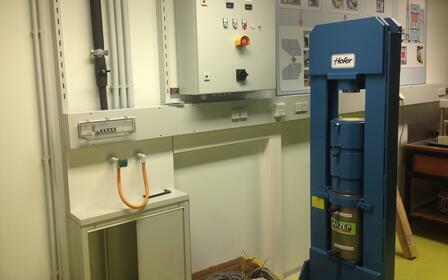 06/02 Our new high-pressure set-up arrived today. This will enable us to conduct reactions at up to 14 kbar. 06/02 Congrats to Alex for winning the Poster Award at the "1st Alpine Winter Conference on Medicinal and Synthetic Chemistry". 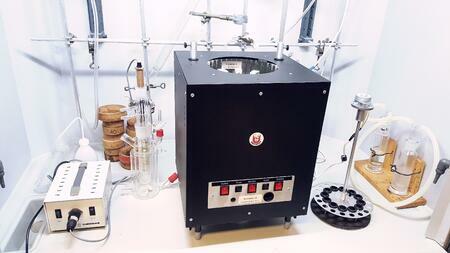 05/02 Electryfying chemistry is now possible with our new ElectraSyn 2.0! 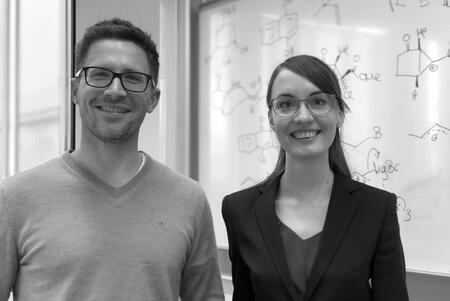 08/01 Congrats to Tatjana and Raphi for acceptance of their manuscript "9-Membered Carbocycles: Strategies and Tactics for their Synthesis" in Chemistry - A European Journal! 08/01 Tatjana has successfully defended her PhD Thesis. Congratulations Dr. Huber! 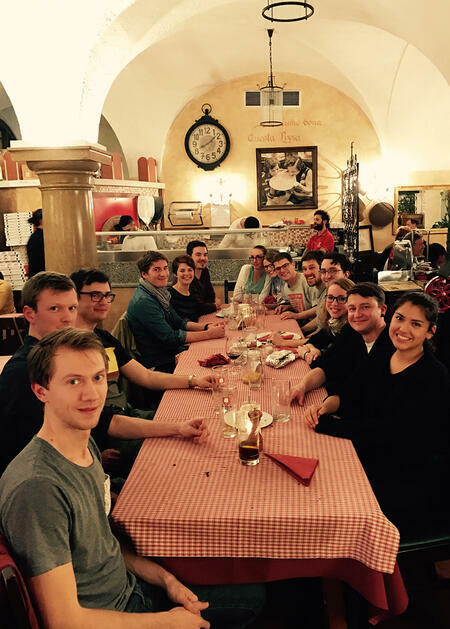 08/01 Giandomenico from the Melchiorre Group joins the group for an exchange stay. Welcome! 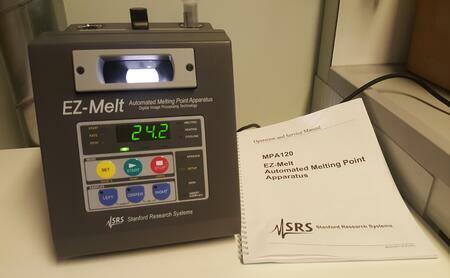 18/12 The new automated melting point apparatus has been installed! 14/12 Adriana has successfully defended her PhD Thesis. Congratulations Dr. Grossmann! 11/12 David has joined the lab for his Master Thesis. Welcome to the group! 04/12 Johannes has successfully defended his PhD Thesis. Congratulations Dr. Feierfeil! 01/12 Congrats to Johannes on the acceptance of his manuscript "De Novo Synthesis of Benzannelated Heterocycles" in Chemistry - A European Journal! 15/11 Julian has joined the lab for his PhD Thesis. Welcome to the group! 13/11 Tesi has successfully defended her PhD Thesis. Congratulations Dr. Preuhs! 02/11 Congrats to Raphi on the acceptance of his manuscript "A Modular Synthesis of Tetracyclic Meroterpenoid Antibiotics” in Nature Communications" and thanks to the Brönstrup Group for the highly appreciated collaboration! 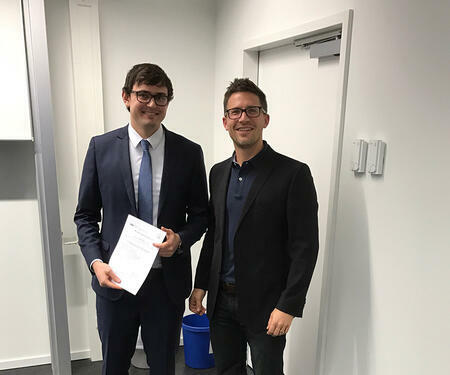 30/10 Congrats to Alex for receiving a 2017 Römer-Award for his Master thesis! 10/16 Lukas Wein joins the lab for his Master thesis. Welcome to the group Lukas! 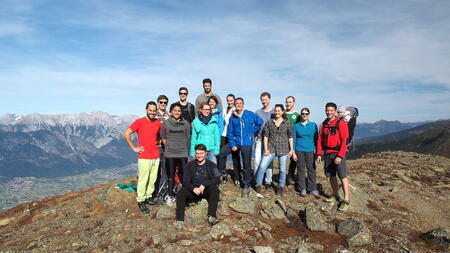 10/13 Congrats to the group for climbing the Patscherkofel. 09/24 Congrats to Raphi for finishing the 44. Berlin Marathon! 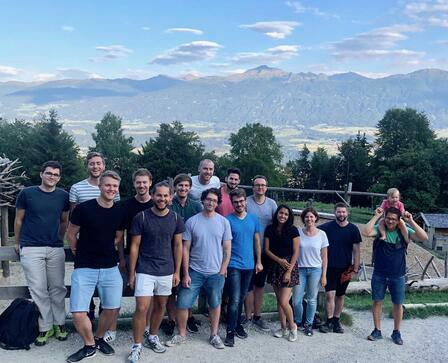 09/18 Matthias and Franz have finally moved to join the group at Innsbruck. 09/15 Expansion of the lab space and installation of additional fume hoods. 08/29 Aylin Hirschvogel joins the lab for her Master thesis. Welcome to the group Aylin! 08/27 Meet Tommy at the Villars Summer School 2017. 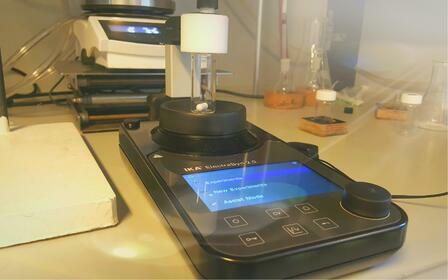 08/10 The brand-new Rayonet system arrived and completed our photochemistry set-up! 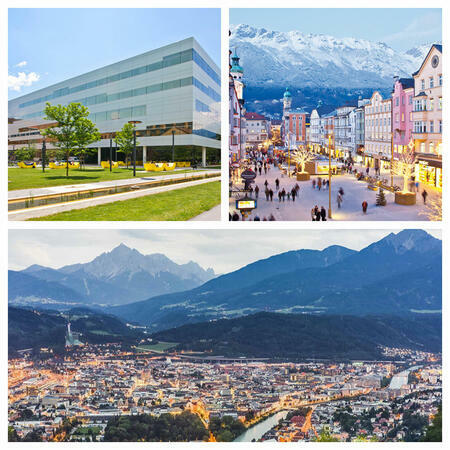 07/26 The lab is moving to the University of Innsbruck. 20/06 Inspection of our future labs at the University of Innsbruck. Looking forward to our visit. 09/05 The new group page is currently under construction and will be available at www.uibk.ac.at/organic/magauer. 01/05 Franz is joining the group for his PhD thesis. Welcome Franz! 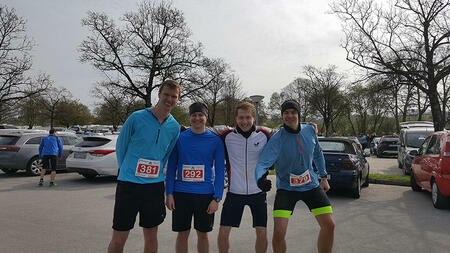 22/04 Congrats to Alex, Ben, Johannes and Raphael for finishing the Andechs Trail Run. Great job!! 12/04 Tommy has accepted an offer from the University of Innsbruck as Full Professor of Chemistry. Looking forward to our move in August! 12/04 The Spartan–Odyssey workshop with Dr. Peter Trojanowski takes place. Special thanks to Tatjana for the organisation. 01/03 Matthias has joined the lab for the second part of his PhD thesis. Welcome to the group Matthias! 01/03 Alex is rejoining the group for his PhD thesis. Welcome back Alex! 23/02 Tommy wins the 2017 DECHEMA Early-Career Researcher Prize for Natural Product Research. Thanks to everyone! 15/02 Sofia is rejoining the group for her PhD thesis. Welcome back Sofia! 09/02 Thanks to Kevin for taking care of the HPLC-MS installation. Well done! 02/02 Ivica joins the lab for his PhD thesis. Welcome to the group! 01/02 Official start of the ERC project "HALODRUGSYN". 01/01 Happy New Year everyone! 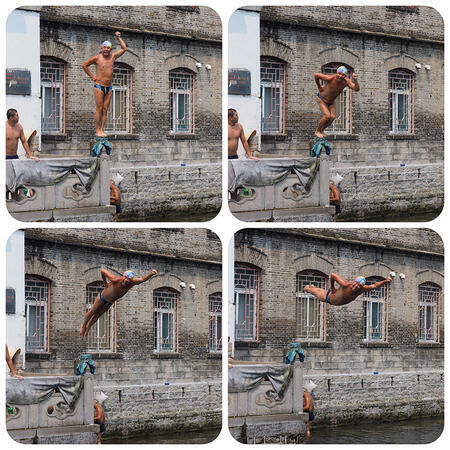 19/12 Klaus has successfully defended his PhD thesis! Congratulations Dr. Speck! 02/12 Cedric will receive the Klaus-Grohe Prize 2017 of the GDCh in Bern. Congrats and Happy Awarding! 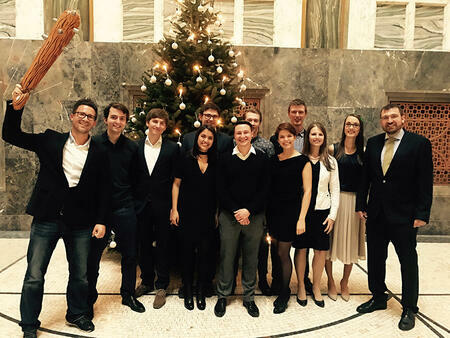 01/12 The anual Trauner-Magauer Joint Christmas Party takes place! 29/11 Congrats to Cedric on the acceptance of his Perspective article "Bioinspired Total Syntheses of Terpenoids" in Organic & Biomolecular Chemistry! 17/11 Congrats to Klaus on the acceptance of his manuscript "Evolution of a Polyene Cyclization Cascade for the Total Synthesis of (–)-Cyclosmenospongine" in Chemistry - A European Journal! 16/11 Cedric is leaving the lab to start a new adventure at Berkeley (Sarpong Group). Have fun and enjoy your time in beautiful California. The group will miss you! 14/11 Kevin joins the lab for his PhD thesis. Welcome to the group Kevin! 27/10 Congrats to Cedric and Klaus for beeing awarded a Römer PhD Prize 2016! The award ceremony will take place on December 2, 2016. 12/10 Cedric has successfully defended his PhD thesis! Congratulations Dr. Hugelshofer! 24/09 Ben Marsh from the University of Nottingham (Adviser: Prof. Chris Hayes) joins the lab as a Postdoctoral Fellow. Welcome to the group! 14/09 Congrats to Klaus and Raphael on the acceptance of their manuscript "Convergent Assembly of the Tetracyclic Meroterpenoid (-)-Cyclosmenospongine via a Non-Biomimetic Polyene Cyclization" in Angewandte Chemie! Great Job! 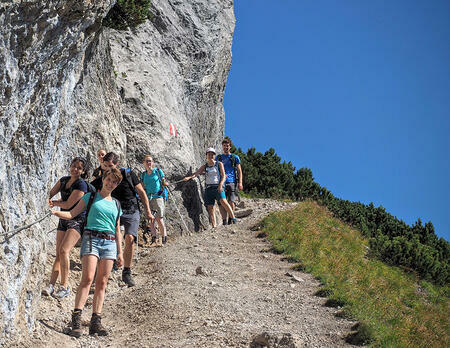 13/09 Magauer group hike at Rofan, Austria. Have fun and enjoy! 07/09 Group Dinner takes place at Monsoon-Glockenbach. Enjoy! 06/09 Tommy receives the ORCHEM Young Investigator Award of the Liebig Association. 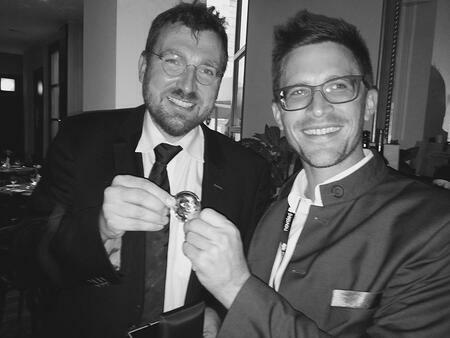 Congrats to Dirk Trauner for being awarded the Emil Fischer Medal! 01/09 Thanks to Sandoz, Austria for supporting the group with lab equipment! 13/08 The group will receive an ERC starting grant! Great job Magaueritas and Magauerinos! 02/08 Ruben Andringa from the University of Groningen (Prof. Adriaan Minaard) joins the lab for an internship. Welcome to the group! 26/07 Congrats to Cedric on the acceptance of his manuscript "A Divergent Approach to the Marine Diterpenoids (+)-Dictyoxetane and (+)-Dolabellane V" in Chemistry - A European Journal! 22/07 The Magauer-Trauner joint BBQ takes place. We also had a chance to update our group photo! 19/07 Alexander Rode joins the lab for his Master thesis. Welcome to the group Alex! 02–03.07 Great program at the URCUP Conference! 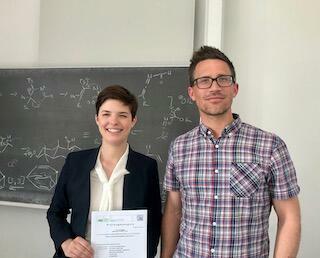 15/06 Congrats to Teresa and Adriana on the acceptance of their manuscript "Rapid Access to Orthogonally Functionalized Naphthalenes: Application to the Total Synthesis of the Anticancer Agent Chartarin" in Angewandte Chemie! 13/05 Simon Schnell joins the lab for his Master thesis. Welcome to the group! 09/05 Congrats to Cedric on the acceptance of the Communication "A Bioinspired Cyclization Sequence Enables the Asymmetric Total Synthesis of Dictyoxetane" in JACS! 01/01 Thanks to the group for their creativity. 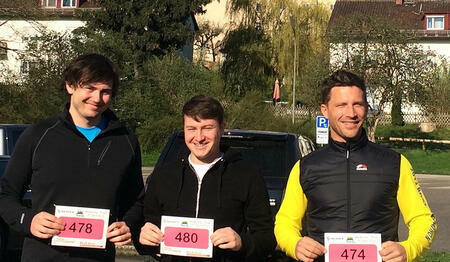 16/04 Congrats to Klaus and Johannes for completing the Andechs Trail-Expert Run! Thumbs up! 05/04 Meet Tommy at Bayer Berlin. 04/04 Sofia Torres Venegas from the University of Vienna (Prof. Nuno Maulide) joins the lab for her Master thesis. Welcome to the group! 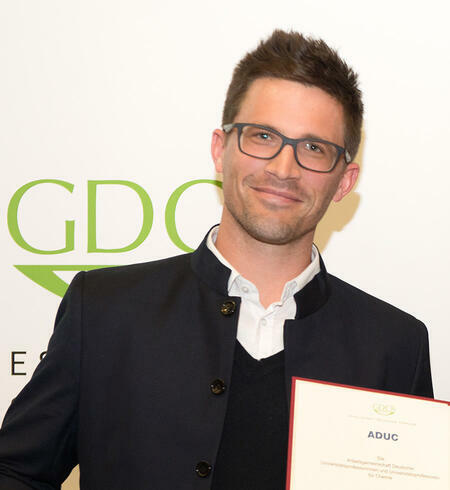 21/03 Tommy receives the ADUC-Prize at the CDT Heidelberg. 07/03 Franz-Lucas from the FU Berlin joins the lab for his Master thesis. Welcome to the group! 01/03 Congrats to Raphael und Klaus for the acceptance of their manuscript "Gold(I)-Catalyzed Enyne Cyclizations: Studies Towards the Total Synthesis of (+)-Aureol" in Synthesis. The results of this work will appear soon in the "Cyclization Tactics and Strategies" themed issue. 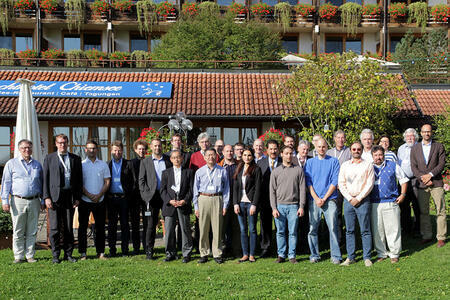 24/02 Great people and science at the 28th Irseer Natural Product Conference! 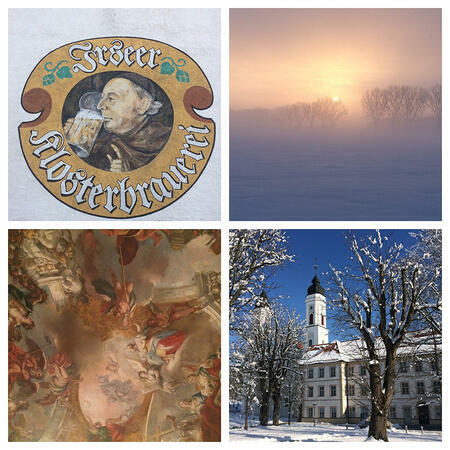 18/02 The annual Trauner-Magauer Ski Trip takes place in Saalfelden, Austria. Happy Skiing! 01/02 Prof. Mario Waser ist visiting the Department of Chemistry. Meet him at the OC Colloquium at 11.15 am. 21/01 Just received our brand-new Anton Paar polarimeter. Happy polarizing! 21/01 Congrats to Adriana for the acceptance of her manuscript "Trihaloethenes as Versatile Building Blocks for Organic Synthesis" in Organic & Biomolecular Chemistry. This review will appear soon in the "New Talent" themed issue. 15/12 Meet Tommy at the Pacifichem 2015 in Hawai! 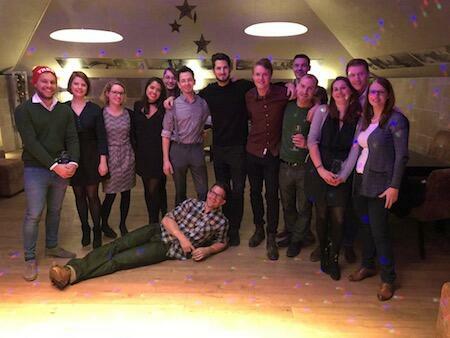 11/12 The anual Trauner-Magauer Joint Christmas Party takes place! 01/12 Congrats to Tatjana and Lara for the acceptance of their Review "Synthesis of Xenia diterpenoids and related metabolites isolated from marine organisms" in Beilstein Journal of Organic Chemistry. This review will appear in the Thematic Series “Natural Products in Synthesis and Biosynthesis II”. 23/11 Christa is back in the lab for another month before starting her PhD in Konstanz! 05/11 New DAICEL Chiralpak columns for our HPLC! 12/10 Prof. Jun Takaya from TTITECH is visiting for the first talk of the Merck-Banyu Lecture Series! 01/09 Visit at Bayer Pharma AG, Wuppertal. 01/09 Lara joins the lab for her PhD thesis. Welcome back to the group! 18/08 Thanks to Prof. Xiaoguang Lei, Prof. Guangxin Liang, Prof. Yunfei Du, Prof. Dawei Ma and Prof. Hanfeng Ding for organizing a fantastic lecture tour! 10/08 Our paper "Ring Opening of Bicyclic[3.1.0]hexan-2-ones" in Angewandte Chemie is Online. 20/07 Congrats to Johannes and Adriana on the acceptance of their Communication "Ring Opening of Bicyclic[3.1.0]hexan-2-ones: A Versatile Synthetic Platform for the Construction of Substituted Benzoates" in Angewandte Chemie. 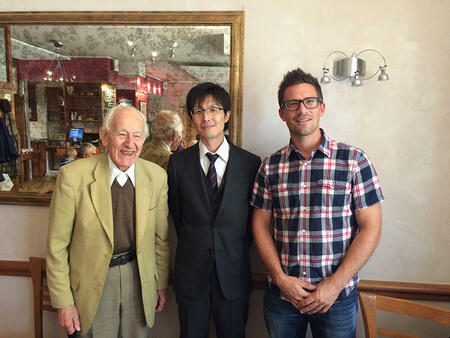 13/07 Prof. Ronald Micura (Universität Innsbruck) visits the Department of Chemistry! 06/07 Prof. JE Bäckvall (Stockholm) visits the LMU! 01/07 The final funding period of the SFB 749 starts. 22/06 Prof. David Milstein (Weizman Institute) is visiting! 11/04 Christa joins the lab for her Master thesis. Welcome! 26/04 The legendary Bürgenstock Conference celebrates its 50th birthday! A week of scientific excellence. 01/04 No April Fool's: Congrats to Klaus on the acceptance of his manuscript "Sequential O–H/C–H Bond Insertion of Phenols initiated by the Gold(I)-Catalyzed Cyclization of 1-Bromo-1,5-Enynes" in Organic Letters. The paper is online! 16/03 Congrats to Cedric on the acceptance of the Communication "Total Synthesis of the Leucosceptroid Family of Natural Products" in JACS. This paper just appeared online! 05–06/03 Evaluation of the SFB 749 "Dynamik und Intermediate molekularer Transformationen"
08-11/02 The annual Trauner-Magauer Ski Trip takes place in Saalfelden, Austria. 05/02 Tommy receives a JSP Fellowship for the Bürgenstock Conference 2015 in Brunnen, CH. 04/02 Congrats to Tatjana on the appearance of her manuscript in J. Org. Chem.! 21/01 Audrey from the Université Pierre et Marie Curie, Paris joins the lab for an internship. Welcome to the group! 16/01 The Beilstein Video is online! Congrats to Cedric, Klaus and Adriana! 07/01 Lara joins the lab for her Master thesis. Welcome! 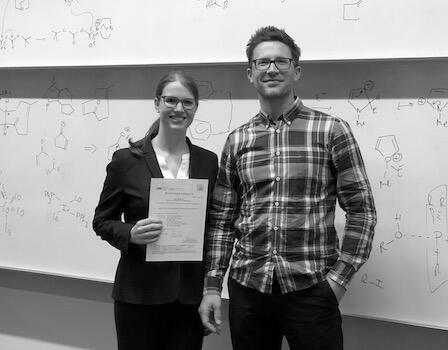 06/07 Congrats to Tesi for the acceptance of her Digest Article "Carbon-Fluorine Bond Activation for the Synthesis of Functionalized Molecules"
01/01 Rapahel joins the lab for his PhD thesis. Welcome back to the group! 11/12 Beilstein TV visits the Magauer Lab. 09/12 Congrats to Cedric on the acceptance of his SYNPACTS manuscript "Strategies for the Synthesis of Antifeedant Leucosceptroid Natural Products"
08/12 Prof. Matthew Gaunt (University of Cambridge, UK) is visiting and the anual Trauner-Magauer Joint Christmas Party takes place. 03/12 Congrats to Cedric on the acceptance of his collaborative manuscript. This paper just appeared in Organic Letters! 07/11 Raphael has submitted his Master thesis and will join the group for his PhD studies in 2015. Looking forward! 24/10 Tatjana is awarded the Römer-Preis 2014 for her Master thesis. Congrats! 16/10 Cedric joins the Li Group in Kunming, China for his research stay. Good luck! 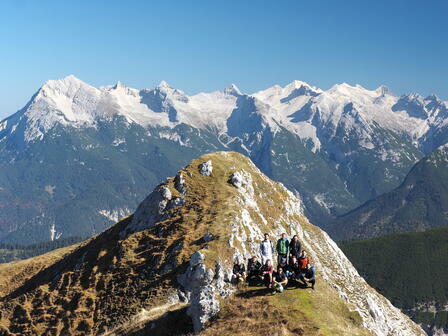 17/09 Group Outing to Sonnjoch (2457 m), Karwendel, Austria. See Photos! 04/09 Cedric's paper in Angewandte Chemie is online. Congrats! 11/08 Michael joins the lab for his Master thesis. Welcome to the group! 07/08 Congrats to Cedric on the acceptance of his manuscript on the synthesis of antifeedant leucosceptroid natural products in Angewandte Chemie! 04/08 Nicole joins the lab for her Bachelor thesis. Welcome to the group! 01/08 The group is steadily growing and we just got additional research labs on the 1st floor! 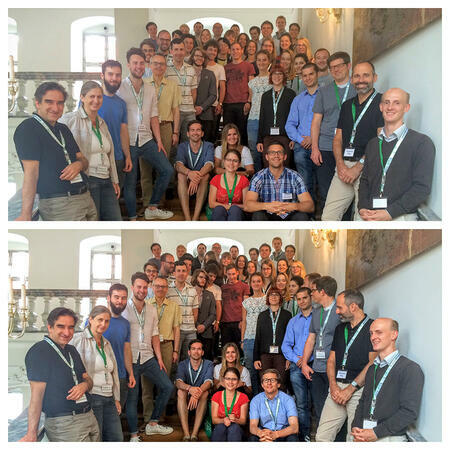 20–21/07 The URCUP conference is takin place in Wildbad Kreuth. Great location. Great conference! 01/07 Tatjana joins the lab for her PhD thesis. Welcome back to the group! 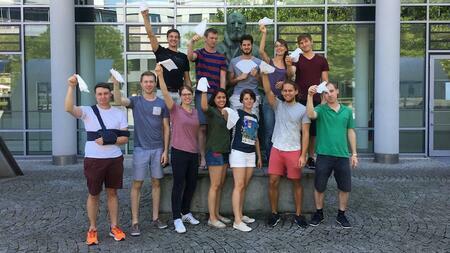 01/07 Johannes joins the lab for his PhD thesis. Welcome back to the group! 29/06 Congratulations to Klaus and Cedric on having finished the "Stadtlauf Munich, 21.0975 km " in spite of pouring rain! 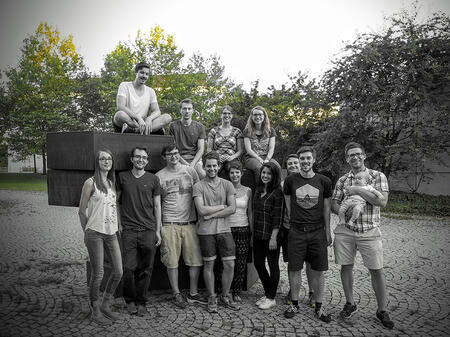 20/05 Tatjana and Johannes "Master thesis BBQ". 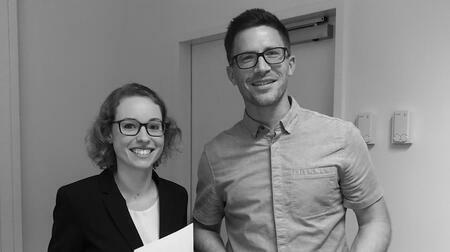 19/05 Tatjana and Johannes have submitted their Master theses. Congratulations! 05/05 Raphael joins the lab for his Master thesis. Welcome to the group! 26/04 Our paper "A Transition-Metal-Free Synthesis of Fluorinated Naphthols" is online. 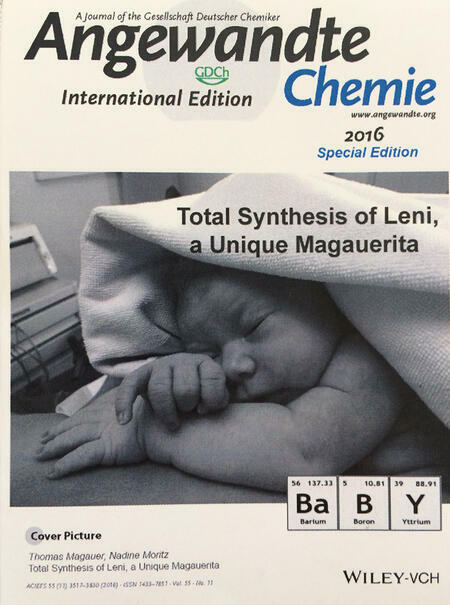 04/03 Congrats to Jeffrey and Tesi on the acceptance of their manuscript on C–F bond activation in Chemistry - A European Journal! 04/03 Adriana is back and joins the lab for her PhD thesis. Welcome back home! 21/02 Evaluation of the SFB TCRC 152 "TRiPs to Homeostasis"
06/02 "High-Pressure Transformations in Natural Product Synthesis" was accepted in Synthesis. Congrats Cedric! 07/01 Michael joins the lab for his F-Praktikum. Welcome! 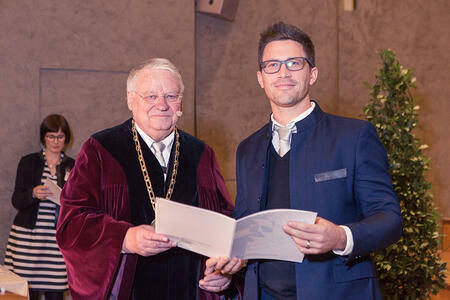 12/13 Klaus is awarded the Römer-Preis 2013 for his Master thesis. Congrats! 12/01 Teresa is back and joins the lab for her PhD thesis. Welcome! 11/18 Prof. Mulzer visits the LMU for his talk "Last reflections on total synthesis"
11/11 Tatjana joins the lab for her Master thesis. Welcome to the group! 11/11 Johannes joins the lab for his Master thesis. Welcome to the group! The BJOC paper "The chemistry of isoindole natural products" appeared online. Congrats Klaus! 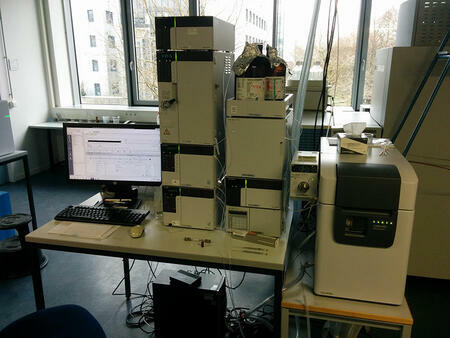 Our new Shimadzu HPLC-System was delivered and installed! Cedric is awarded the Kekulé Mobility Fellowship. Congrats! CIPSM Oktoberfest at LMU Munich (19–20.9.2013), Enjoy the lectures of Fu, Buchwald, Knochel, Toste, Wender,....! Jeffrey is back and joins the lab for his Master thesis. Welcome! Klaus is back and joins the lab for his PhD thesis. Welcome! Cedric joins the lab for his PhD thesis. Welcome! Adriana joins the lab for her Master thesis. Welcome! Daniel joins the lab for his Master thesis. Welcome! Teresa joins the lab for her Master thesis. Welcome! Renovation of Lab F1.053 finally starts. Yippie Yippie Yeah! Andreas joins the lab for his Master thesis. Welcome! 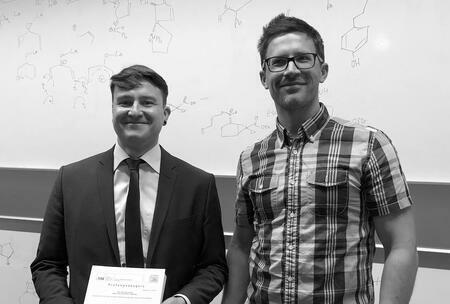 Tommy wins the "Thieme Chemistry Journal Award 2013"
Klaus joins the group for his Master thesis. Welcome! Jeffrey joins the group for his F-Praktikum. Welcome! Simone joins the group for her Master thesis. Welcome! Jutta joins the group for her Bachelor thesis. Welcome!